The objet a is something from which the subject, in order to constitute itself, has separated itself off as organ. This serves as a symbol of the lack, that is to say, of the phallus, not as such, but in so far as it is lacking. It must, therefore, be an object that is, firstly, separable and, secondly, that has some relation to the lack. I’ll explain at once what I mean. – Lacan, Four Fundamental Concepts, 112. Originating in a series of lectures given by Jacques Lacan as early as 1953, the object petit a initially made reference to the infant’s witness in the mirror of the image of its ego-ideal. For the infant, this object is an entrance into psychic, and later, Symbolic life, and marks the first in a series of culminating desires for the other, in this initial case, an idealized self. This desire, once in place in the social realm of the Symbolic, then becomes an invective for the Other’s desire, which the object a represents as unobtainable and not capable of returning or satisfying our own need to know. As Lacan states, “it is this moment that decisively tips the whole of human knowledge into mediatization through desire of the other” (Lacan, Mirror Stage, 5). The meaning we can extract from Lacan, here, is that any attempt made towards knowledge (thought of as knowledge of the Other) can be thought of as mediated by our desire for reciprocity on behalf of the Other (the object a), which remains terminally unfulfilled, and results in the imprecision and impossibilities of language to describe the Real. Within media theory and conceptions of the mass media, images of ego-ideals are produced in order to engage the subject in attempts at identification, which as in other instances of the object a, are little more than failed fantasies of how the Other might hold him. Overarchingly, however, in media studies, the object a is representative not just of the Lacanian concept of lack, but of the displacement of symbolic structures which otherwise prevent us from realizing that our own gaze is mirrored bare in that which we are desiring: the nurse in a televised soap opera; a cartoon character’s faux pas; Stalinism; Goya’s The Naked Maja. When theorist Friedrich Kittler cites the ridiculousness of gesticulations on celluloid or a voice’s lack of timbre on tape, it is not because media is a form of lying or malicious manipulation, but rather “because their trace detection undermines the mirror stage. That is to say: the soul itself, whose technological rechristening is nothing but Lacan’s mirror stage” (Kittler, 150). For Kittler, media is a form of the object a that misrecognizes and manipulates the idea of a necessary existence for the subjects and objects it records, resulting in the frustration of essentializing its representations. 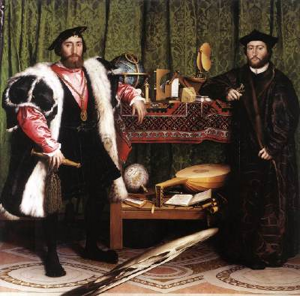 Lacan and his successors often discussed the object a as the personified circularity of the gaze, which is discussed in terms of endowment and entrapment, as in the discussion of the focus of the viewer’s ‘awry’ gaze on the skull in Holbein’s The Ambassadors (Image 1). Much like his conception of the voice, which becomes an object a through the circularity of its connection to its source, the body, one can say that the gaze is also technically mediated. For the subject-viewer, who is conscious of the fact that Holbein’s image is represented through the medium of painting, his gaze and desire fall to the spatially manipulated diagonal skull, which symbolizes not just the desire for the painting to gaze back and confirm the subject-viewer’s lack, but also the object a otherness of what the skull might symbolize, what Lacan terms, “our own nothingness,” which nevertheless repels as well as “captures” us. (‘The Ambassadors’), 1533. HOLBEIN, Hans the Younger. Oil on oak, 207 x 209 cm. National Gallery, London. For feminist media theorists like Laura Mulvey or Kaja Silverman, the imaginary psychic register of the externality represented by the subject’s relationship to the object a is constructed through patriarchical vision. For Mulvey, writing in “Visual Pleasure and Narrative Cinema,” the symbolic order of the gaze constitutes a psychoanalytic desire for narrative and visual power: she argues that cinema organizes the viewer into a masculine subject position that places the figure of the woman on the screen as an object a, or object of desire. For Silverman, the gaze extends beyond the desired object’s body and into fantasies of its mutilation or self-disarray. This becomes an advocacy for a cinema of the “productive look,” in which the authoritative look towards objects of desire is destabilized and redirected at more disenfranchised subjects, who then become idealized as object a.ii Important to note is the concept of media specificity as it relates to the object petit a: in discussion of Mulvey and Silverman and their relegations of the gaze and its narrative power, the specificity of cinema as a medium is part of what propels the specific organization of that media as an object a. 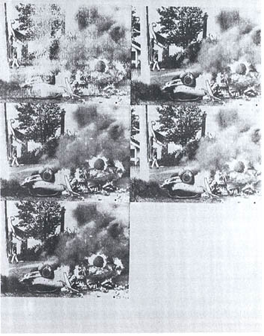 Image 2: White Burning Car I, 1963 by Andy Warhol. for the Visual Arts / ARS, New York. The production and defense that Foster introduces in Warhol’s repetitions refers not only the ability of the work of art as an object a to propel the viewer into desiring attempts at interpreting or ascribing meaning to the essence of that which is Other, but also the inability of this desire to find symbolic results within the domesticated terms of consciousness. In this way, meaning for the viewer is either condensed into metaphor or displaced into metonymy. Because the chain of signification in Warhol’s images, themselves reproductions, is formed by a broken series of signifiers that remain, in Derrida’s sense, at play, nothing leads to the signified. The ‘contradictory’ occurrences of opening and warding off traumatic significance mirror the illusion of a unified consciousness and echo the object a as the premise of lack that language (and significance within it) depends on. We cannot merge with Warhol’s repetitious images; at the same time, the viewer cannot be the center of the system within which we view or understand them. Similarly, in his discussion of the effects of photography in the seminal volume, Camera Lucida, Roland Barthes notes, “The photograph does not call up the past (nothing Proustian in photography). The effect it produces upon me is not to restore what has been abolished (by time and distance) but to attest that what I see has indeed existed.” (Barthes, 12) The object a here, the photographic medium as object, is not capable of restoration or restitution in the Symbolic realm of language. Instead, it exists only as an ideal image of the other, which tempts us with the fascination of knowing more, and ultimately becomes the point of inscrutability, or the ‘abolishment’ of any representation of symbol of the Other’s desire for us. In the contemporary context of media theory, the object a isn’t simply an external image placed before the public in order to frustrate attempts at a collective desire for essence; rather, the object a can also be the ideal self-image of that public, the conception of itself as addressed by corporate news broadcasters, theoretical pundits, screen stars and iconic artists. Similarly, the desire for these self-images as object a by a public mediated through television or the internet is no different than that of a public addressed directly by the artist or speaker. As Lacan states in Television, “there’s no difference between television and the public before whom I’ve spoken for a long time now, a public known as my seminar. A single gaze in both cases: a gaze to which, in neither case, do I address myself, but in the name of which I speak” (Lacan, Television, 3). Interestingly, for Lacan, this quotation undermines his position as would-be media theorist; unlike the careful attention given to the specificity of media by critics and scholars like Mulvey and Silverman, this would seem to suggest that media as an object a is marked by a certain unspecificity. Finally, the impossibility of ascertaining what, exactly, the Other would want from us makes these images representative of its externality centrally positioned in a system that we, as subjects, cannot impose. It is through our marginal relegation in the context of media and the object a that we must assess what occurred in our attempts at the reciprocity of desire with the unobtainable realm of the Real. It is the object petit a that lures us into the Real that is beyond language, and through language that we conceive and understand the Symbolic context of our attempt at acquiring meaning as the Other’s desire in that realm. In media theory, where a certain amount of debate and discourse focuses on the attraction, or better, obstacle of pleasure, it shouldn’t seem unique that an unconscious system of meaning holds desire to that which is unobtainable in words or the bounds of consciousness, but only expressible through failure. Or, in the words of Lacan, “that object is the one to which we come . . . in that it leaps from its place, like a ball that escapes during the fray in order to score a goal on its own” (Lacan, Television, 111). ii For additional information on feminist media critiques of object and Other in the Lacanian Symbolic, please see Laura Mulvey, Visual Pleasure and Narrative Cinema (1975) and Kaja Silverman, The Threshhold of the Visual World (1996). Benjamin, Walter. “Art in the Age of Mechanical Reproduction,” in Illuminations, ed. Hannah Arendt and trans. Harry Zohn. New York: Schocken, 1977. Fried, Michael. Art and Objecthood: Essays and Reviews. Chicago: University of Chicago Press, 1998. Kittler, Friedrich. Gramophone, Film, Typewriter, trans. Geoffrey Winthrop-Young and Michael Wautz. California: Stanford, 1999. Lacan, Jacques. Four Fundamental Concepts of Psycho-Analysis, ed. Jacques-Alain Miller and trans. Alan Sheridan. New York: Norton, 1978. ————. Television: A Challenge to the Psychoanalytic Establishment, ed. Joan Copjec and trans. Denis Hollier, Rosalind Krauss, and Annette Michelson. New York: Norton, 1990. ————. “The Mirror Stage as formative of the function of the I as revealed in psychoanalytic experience.” Ecrits, trans. Bruce Fink. New York: Norton, 2002.